At every place we go and spend money, we want good customer service. The people that a company employs who have direct contact with customers or patrons often act as the “face” of the company. A poor experience can lose a customer or worse. Some people get so enraged after a poor customer service experience that they will go to great lengths to ensure that everyone they can get in contact with knows of the experience. As consumers, we have every right to be treated fairly and with the utmost respect by customer service associates. Additionally, if we are not treated well, we have every right to voice our complaints to management in hopes of changing future experiences for ourselves and other customers. Every time I think of a place synonymous with first-class customer service I think of Chick Fil-A. If you are unfamiliar, Chick Fil-A is a fast-food chicken restaurant that has franchises in most US states. I have NEVER had a poor experience at this restaurant, even though I visit frequently. Their associates are always curteous, helpful, efficient and sincere. The employees can frequently be heard thanking customers with their trademark, “my pleasure”. I have heard this phrase countless times, and every time it was uttered, the associate seemed sincere. As if it really was their pleasure to help me. There is almost nothing more frustrating than a poor customer service experience. Whether it is an ignorant employee who has a poor attitude and is slow to help, or a manager who believes that he/she is invincable and that your problem or issue is not worth his/her time, almost every customer facing employee has an opportunity to impress or enrage. There are plenty of establishments that I absolutely REFUSE to patronize because of a poor experience in the past, and I am sure that I am not alone here, right? Word of Mouth is the most powerful tool we all have to express our displeasure with a particular business. How many times have you thought of going out somewhere, and decided to skip one place or another because you heard a bad word about the service or the people who work there? Just a few people badmouthing a business can cause it to go out of business…seriously. A Large Scale Strike can be launched by just one person. About 10 years ago, I was working at a large warehouse store. The customer service desk was my main station. I handled returns, big-ticket electronic items, and all customer service issues. One day, a man came to the counter looking to get a reduced price on the floor model of a computer we had. It was not unusual for us to discount the floor model if we did not have any more coming to the store. (This was the case here). I let him know that only our general manager could discuss a price reduction on items, which was fine by him. Our manager, (I’ll call him Tim) who was not the smartest man I ever knew (but he thought he was) came over to talk to the man. I let him know what was being asked for, and told him that we would not be getting any more of this particular model in the store. Tim responded as if he were insulted. He explained that he is not able to negotiate the prices on any items, and that “We are running a business here, not a flea market”. The customer did not put up much of a fight. He accepted the oafish and cocky actions of my idiotic manager and left. 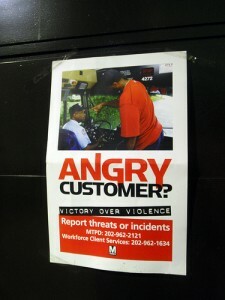 Here’s where the strike comes in: About a week after the incident, a newspaper article made it’s rounds at work. There was a piece in the Op-Ed section about the treatment that our manager dished out…Turns out, the gentleman who was looking for a slight discount on a partially-used computer (and had every right to ask) was a writer for the paper. My manager just happened to irritate the wrong man. He did things like this quite often, so it came as no surprise to me that he finally got called out. This incident was only the first in a series of events that eventually led to the prompt firing of this manager. A good move by the company as far as I’m concerned. Before the canning, Tim was asked to invite the newspaper writer to the store and issue an apology, along with a discounted rate on a new computer. He had since found a model that he liked at another store, but did come to the store and graciously accepted the apology. As mentioned recently at The Consumerist, you can consult the Consumer Service Scoreboard. This service ranks top companies based on (primarily) customer complaints. This is just one place to look. A simple search using terms like “Customer Service Applebee’s” can lead you to reliable critiques that will help you make shopping and service decisions accordingly. Of course, your satisfaction is not guaranteed when consulting ranking services or trusting third party recommendations. You never know when you may catch an employee on a bad day, making you the lackey for his or her onslaught. For my dollar, customer service is paramount. I would go to the ends of the earth to find helpful, curteous and honest people handling my transactions. Hopefully, most companies feel the same way and realize how much each individual who has customer contact affects their everyday business. Most of the time, they deserve a big thanks for being one of the very few “fast food” places that do not eff-up orders, are nice, and are always quick and efficient.